Stanley Company is the top choice of when it comes to Chicagoland residential concrete contractors. On this page, we will help you make an informed decision in selecting the most appropriate design, material, and color for your project. 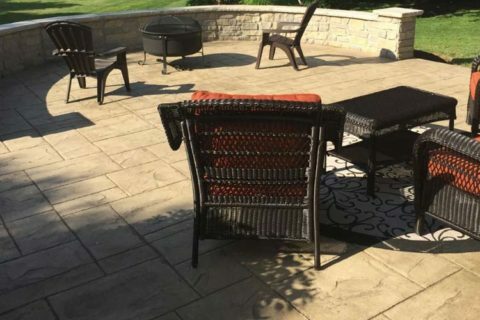 Stanley Company uses premium materials and advanced techniques to give you the design and beauty you desire for your driveways, walkways, and patio while gaining the durability and strength of concrete. The size and dimension of your project is vital, whether a patio, walkway or driveway. Stanley Company is ready to give you a hand in ideas you can consider to achieve the most effective use of your space while achieving elegance and function. View Stamp Styles Stanley Company offers different stamp styles. To help narrow down your choices, visit the showroom for more information like the accurate shape and texture of the material. 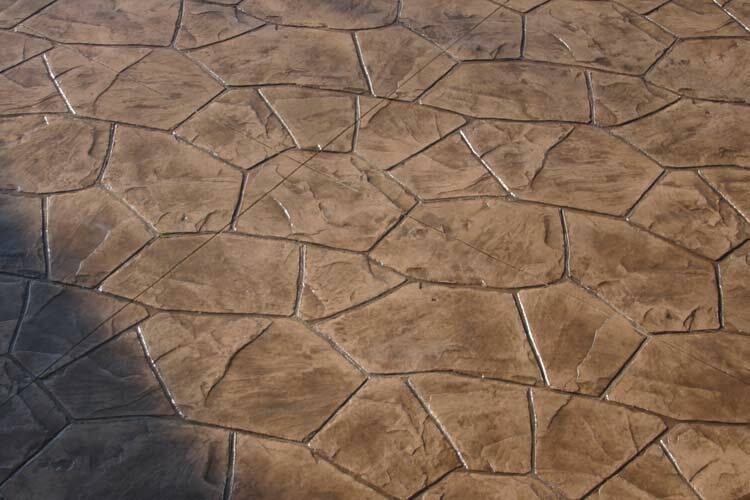 View Base Colors Stamped concrete is colored using a two-fold system. Derived from the Uni-mix, the primary color is added to the redi-mix truck which results in the concrete taking on the selected color. View Release Colors Applied and stamped into the top of the concrete, the release color gives the material a two-toned color, which is not as simple as two-paint colors. The release gives a shade to the base color. If the customer selects a Uni-mix color, the release is added next. Finally, the actual sample is placed on site so the customer can see and compare the output in a real-life setting and lighting condition. Designing steps involves a few basic procedures. Over the years, we have received positive feedback on the use of decorative stairways on the overall appearance of a project. Following are examples of our stained concrete in different colors. For more information, view our stain chart. How long will my concrete last? 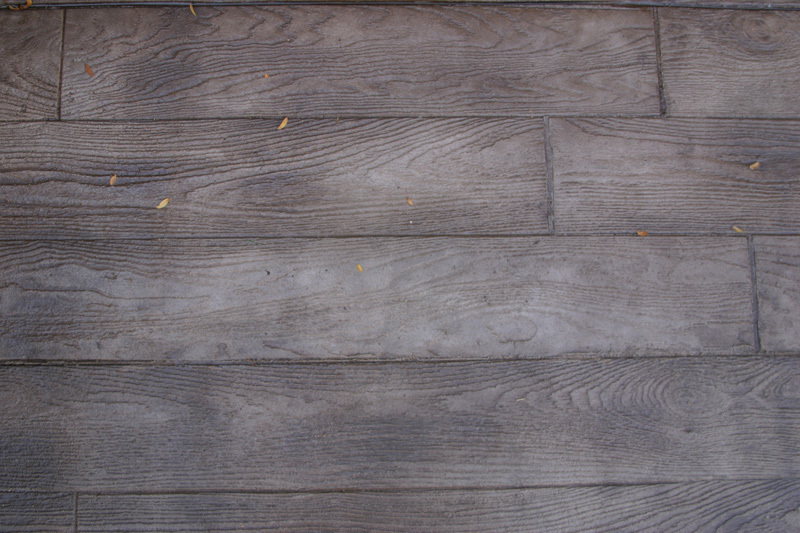 The life of concrete is incredible when compared to wood decks or other composite material. The exact length of time is indeterminate. Most of the concrete that we replace is in neighborhoods that are at least 20 years old and most of the time it is due to settling and the concrete is actually fine (avoidable if properly reinforced). We have stamp work that was installed over ten years ago that looks like the day it was installed. If properly installed and maintained, it still remains the longest lasting medium for construction today. The guarantee that we provide is the same that we have given since our first job. We provide the highest level of workmanship for every job and will stand behind it for the life of the product. The concrete we purchase is produced by a separate company; we have fostered good relations with our suppliers and have thoroughly researched mix designs to provide the best concrete for each job and, in the event of a problem, to provide quick and comprehensive solutions. I recall a conversation with a customer that called to have us pour an extension on a patio that we installed eight years prior. He was very pleased with our previous work and commented that it never cracked. 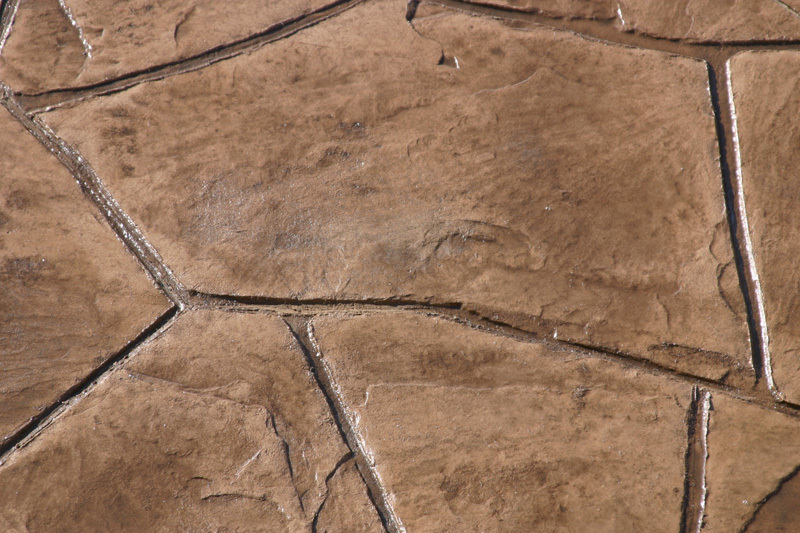 Always believing that a well-informed consumer is our best customer, I began to explain how all concrete cracks but what is done so that they are not visible. 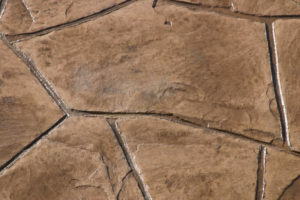 All of the grooves in concrete, approximately every five feet on a public sidewalk, are what are called control joints. These grooves create a weak spot in the concrete. This weak spot is an attempt to control where the concrete cracks so it is not visible. Ninety-nine percent of the time this is where the concrete will crack and not be visible. 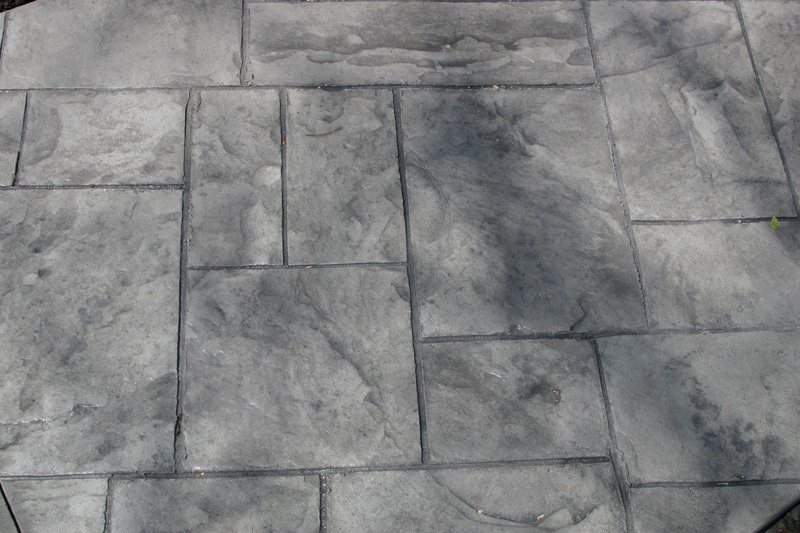 How is stamped concrete done? The process of stamping concrete is similar to any type of concrete pour. The place for the patio, walk or sidewalk is cleared and excavated to make room for gravel and concrete. The area is framed to the shape and style that was designed. A gravel base is added, 2-4 inches depending on local codes or engineering. Steel reinforcement is placed and then the concrete is ready to be poured. The customer has previously selected colors and stamp style. When the concrete arrives the proper color is added and mixed into the concrete. The concrete is then placed and smoothed to a trowel finish (similar to a garage floor). Once the concrete has set some it is checked for readiness to stamp. Once the proper set is confirmed the second color, release, is spread over the concrete. 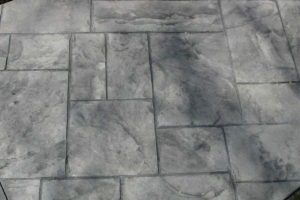 The stamps are then placed on the concrete and manually pounded into the concrete leaving the desired impression. Once the area is completed, the concrete is left to harden overnight. The following day the concrete is saw cut for control joints. When it is determined that the concrete has set enough it is pressured washed to remove the extra release and sealed when fully dry. The following day the area is ready for walking traffic. A full 7 days is necessary for cars. A typical job is three to four days.